Firstly I would like to thank Mick Leightley and his Team at SAP for being most accommodating during our extended stay for the fitment of VB Fullair suspension to our 2017 Swift Bolero 724 Motorhome. Having been involved in Aerospace Engineering for most of my working career and a keen Automotive DIYer, it was easy to appreciate the Engineering knowledge/equipment SAP have at their disposal, also the meticulous attention to detail applied to the installation. At all stages of the installation I was invited to inspect the work, which from a personal prospective was most welcome. On both accounts, the VB system performs admirably, particularly the ride comfort, which is a vast improvement over the standard ALKO/Sevel suspension system. To conclude, owners of Motorhomes with a standard ALKO/Sevel suspension system should consider VB full air suspension a “must do” addition and I cannot recommend highly enough the service provided by Mick and the team at SAP. Just had E&P levellers and full VB air suspension fitted by Mick and his great crew at S.A.P. Companies like his are becoming hard to find, great service, honest in their dealing, caring and totally trustworthy. How many times have you had work done in a garage or elsewhere only for someone to say “oh we came across a problem we didn’t account for and it will cost more because of that” Unless it’s really serious Mick will just get over it, sort it and carry on to do a first class job. Mick and partner Jill deserve all the success they can get and I wish them both a great future. Thanks for a stress free job well done. I‘d had E & P hydraulic levelling on my last motorhome and when I ordered a new model from SMC Motorhomes in Newark-on-Trent I’d envisaged having to have it fitted again in the same way. This meant travelling a fair distance to my N.W. supplier, leaving the motorhome with them and then having to return to collect it two days later, which meant my wife having to drive me to them on two occasions. When checking E & P’s website I noticed that SAP Ltd wasn’t that far from Newark and SMC Motorhomes confirmed that they were a first class company and recommended them highly. I phoned SAP and to my delight Mick agreed to collect my new motorhome and take it to his workshop, do the jobs and then return it to Newark, so when I collected my new campervan these jobs would have been done, which meant no further aggravation on having them sorted out later. This would save me a great deal of travelling and messing around so I phoned SAP for a quote. The price was very good especially considering that it was a more difficult installation than my last ‘van with the pump and hydraulics having to be mounted underneath the vehicle. I also decided to have VB air assistance on the rear and uprated springs on the front as I’d have a considerable payload. I can’t praise SAP enough. The installation was first class and on the occasions where I’ve had questions nothing has been too much trouble. I can thoroughly recommend SAP. As a businessman myself I recognise a well-run and professional company, which understands that happy customers are the best kind of advertising any firm can have. Thank you for the excellent service of fitting an E & P hydraulic levelling system to my Elddis Autoquest 115. I am absolutely delighted with it! I've found it very easy to use; providing a level and stable floor, no rocking on suspension or in the wind. It feels like a different motor home. Even tilts to empty the waste tank! The added bonus is that if ever I get a puncture, I can quickly and easily jack the wheel up without hunting for the jack and finding the correct jacking point. Brilliant! The system makes 'parking up' for the night (or even just a picnic) very easy and reduces stress of setting up ramps and trying to get level, especially at night. It's so easy. Engine running, handbrake on, push 'on', check how the van is lying, push 'legs down' and stand back, whilst it does its 'thing', switch off, enjoy. I appreciated being shown the whole installation and the care your team have taken in fitting it. I am pleasantly surprised how unobtrusive the whole system is. I definitely feel as though I go up in the world when I use my E&P system! After going to the Motorhome Show and speaking to Mick from SAP Ltd of Doncaster, we decided to invest in the E&P Hydraulic Levelling System. Mick quoted an excellent price and answered all our technical questions. The team worked all over the weekend fitting the system on both motorhomes that we had booked in, Mick and his team did the job with real professionalism and I would recommend them to anyone. We were able to stay in the motor homes overnight on site, a great service. We are very pleased indeed with the Hydraulic level system you fitted to our caravan. It has made managing the caravan much easier – and it is more secure since we can now easily fit both Alko locks. The service provided by your firm was exemplary. You fitted the system quickly and efficiently, and took great care to explain to us how the system works. We are very grateful. I can't recommend Mick and all the guys at Specialist Automotive Products enough, if you are looking at their website then you have found one of the best companies to deal with. We had an E&P Hydraulic Levelling System fitted in July along with friends with the same type of van. Mick and his team could not of been anymore helpful, they did everything they could to accommodate our needs and did the work on both van in great time. I will definitely be using this company again. A huge thank you to Mick Leightley and his team at Specialist Automotive Products Ltd (SAP) for their professional advice and exemplary workmanship. Having worked in the engineering industry for over 40 years, I can say with confidence that SAP has been the best company I have ever dealt with. Our 2016 Carthago e-line 50, on a Fiat/Alko chassis, came off the production line with a gross weight of 4500kg which left us light on payload over the rear axle and gave us a rather bone shaking ride! Since having full VB air suspension fitted, in conjunction with uprated wheels and tyres, the gross vehicle weight has been increased to 4800kg which has given us an extra 200kg over the rear axle. What a difference the system has made, the VB air does what is says on the tin and more. We have much reduced road noise (50%), a smoother/quieter ride, increased stability (safer), additional payload and a self-levelling system that is totally brilliant (the icing on the cake). A first class five star service, delivered by a truly professional company. This is our second E&P Hydraulic levelling System, the first was on our Buccaneer twin axle caravan in 2012 and it was fantastic. So simple and easy to use. In 2015 we purchased a motorhome and due to difficulties levelling a motorhome we decided to ask about a levelling system. Mick was brilliant and explained things clearly, and we decided to proceed and buy one. Some may say this is an expensive luxury but with the use of a remote control, even in pouring rain (whilst we remained warm and dry), the motorhome was levelled. So easy to use, no hassle and it does an amazing job, very stable. Bear in mind it is also very useful should you have a puncture, simply raise the relevant tyre off the ground. and change the wheel, not forgetting it will help relieve the pressure on the tyres when storing during winter. Mick's knowledge and expertise was second to none and the whole process was smooth and painless. It is the best thing we have bought for the motorhome and would certainly recommend one it is invaluable. I recently had the E&P Hydraulic Levelling System fitted to my Fleetwood Flair RV. Having used it on my recent tour of Europe it worked excellently. Apart from when I inadvertently dislodged a fuse when attending to another issue. But it was resolved over the phone satisfactorily. It certainly saves all that chocking and ramping the wheels. 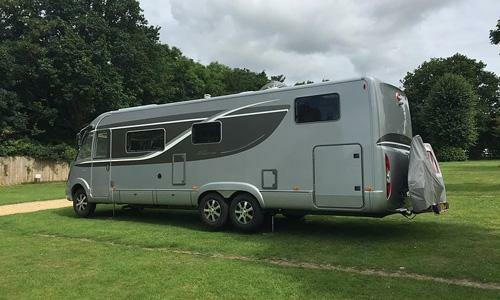 SAP Ltd, Doncaster were recommended to me by fellow motorhomers and after speaking to Mick Leightley I was very happy to go ahead with having VB Full Air Suspension fitted to my Burstner Elegance motorhome and it is superb. I highly recommend SAP Ltd because of their knowledge, expertise and aftersales. They definitely go that extra mile for their customers. I had VB FullAir suspension and E&P Hydraulic levelling fitted by Mick Leightley of SAP Ltd, Doncaster, to my Autotrail Cheyenne 840d and must say it has made a world of difference to the ride comfort and handling of the motorhome, with the added advantage of keeping its ride height level at all times regardless of the weight. I think if you plan on keeping the Motorhome for any length of time it's worth the additional expense, and must say Mick Leightley did a first class job. Researched the various suppliers of levellers and concluded that E&P suited my requirements. Rang Mick at SAP Doncaster for clarification on a few technical queries and the options available. He took the time to fully explain all aspects of the system, with his confidence and passion in the product, along with his friendly nature, I was "booked in" for the next week. When it was time to collect my motor home, I was running late, Mick assured me it wasn't a problem and that he works all hours to accommodate his customers. I arrived after 7pm and met Mick who was still working on another vehicle. Even as late as it was, Mick never rushed the demo and thoroughly talked through the operating procedures. It's a pleasure giving a positive recommendation for a "genuine nice guy" selling and fitting a great product and having the reassurance that in the unlikely event should anything go wrong, SAP would respond immediately! I would like to thank Mick Leightley of SAP Ltd, Doncaster for the fitting of the V.B air suspension to our Peugeot Auto Sleeper motorhome very professionally done and the help and advise was at its best. This was money well spent the difference is brilliant would fully recommend it to fellow Motorhomers. As the only VW-approved air suspension for our new T5 camper, VB was the obvious choice. The tricky bit was finding the right company to fit it. 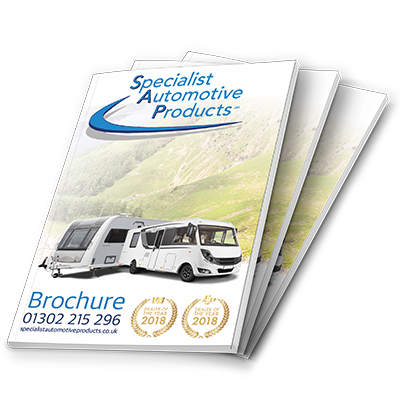 I approached most of the authorised suppliers but after much research, we chose Specialist Automotive Products, even though they are 300 miles from us. Mick was so passionate about the system and had all the answers to our questions, clearly gained from huge experience of fitting VB, and this gave us the confidence to go ahead with them. The result? Mick fitted the system on time as agreed, even working very late into a Friday evening to ensure we could continue our holiday as planned. The system is everything and more than we expected. We went for the auto-leveling option too, which is just fantastic. The system is not cheap, but money well spent, and we were right to trust our precious camper to SAP. I can't recommend them highly enough. We took our Burstner 810 motorhome to Specialist Automotive Products for a VB full air suspension system fitting. Mick Leightley met us and explained the system in full before ordering the kit. He could not have been more helpful, answering questions and showing how the system worked. He was a pleasure to deal with, very friendly and nothing seemed too much trouble to him. Our installation was completed entirely to our satisfaction and we will be returning in the future for any further work required on our motorhome. We had both VB air suspension and E&P self-levelling installed on our new motorhome. Mick and team did a first-class installation and were a delight to deal with. Highly recommended. Having seen the E&P Hydraulic automatic levelling system on the Caravan Finder TV channel and, also at the NEC Motorhome and Caravan Show, my wife and I, both retired and relatively new to caravanning, decided that we would have the system fitted to our 2013 Lunar Quasar 452 caravan. As we live near Lisbon, in Portugal, picking a qualified engineer, place and time, to have the system installed was somewhat difficult. After researching comments on the internet, but more particularly, having read one comment from a motorhomer, in the South East of England, who takes his motorhome to Mick and his team for any engineering work, I decided to make contact with Mick. A couple of emails and 2 telephone calls later my order was placed. This was in September 2014 and the system was fitted during our visit to the UK in May 2015. Having now had the system for 6 months, without any problems, I would highly recommend it to other caravanners. Secondly, and just as important, Mick, a most highly professional and hardworking engineer, is also a very kind, friendly, sincere, trustworthy and honest person who will ensure that any customer will be rewarded with an extremely high level of service. I would highly recommend Mick and his team, at Specialist Automotive Products Ltd, to anyone reading this testimonial. SAP are an absolute breath of fresh air. The advice, service and help I received were exceptional and I am delighted with the work quality. They have transformed my Motorhome's comfort. SAP supplied and fitted both an EP Hydraulic levelling and a VB Air suspension system to our new Carthago Chic S Plus in August 2014. We were extremely pleased with both the installation and the performance of the products in particular the thought and care taken in siting the power units and the controls. The VB Air suspension not only increased the stability but also the comfort of the ride; the EP Levelling system provided a solid and stable platform whilst parked; furthermore the ability to tip the vehicle to assist tank drainage is a most useful and much appreciated function. At a later date we commissioned them to fit an Alko -Saweko tow bar which we feel is one of the best on the market, again the work was carried out in a most professional manner. During the first few weeks we did have a number of queries but these were quickly answered by Mick Leightley, the owner, who always made himself available. Their well equipped workshop, back up if there should be problems, care and attitude to their customer's vehicles means that you can have absolute confidence in SAP. Having decided to fit VB Full Air Suspension and E&P Hydraulic Levelling to our new Burstner Elegance, following some research and personal contact we chose SAP Ltd as Mick Leightley appeared to have a solid reputation and came recommended from our dealer Camper UK. We have not been disappointed, Mick consulted with us throughout the process and even invited us to view the completed installation at his workshops in Doncaster. You cannot fail to be impressed with the quality of workmanship and professionalism of Mick and the team at SAP. Importantly Mick's 'after sales' support is as good as the initial installation. There are dealers closer to us and the round trip to SAP Ltd is over 500 miles for us, one that is worthwhile, we could not have chosen better and would recommend them without hesitation.